Shortly before he received the Gusi Peace Prize 2016 for Literature in Manila Nicholas Hagger was asked by the Gusi Foundation to present an original oil-painting showing a scene from the countryside near his home town, to be placed in the Gusi Museum, Manila. 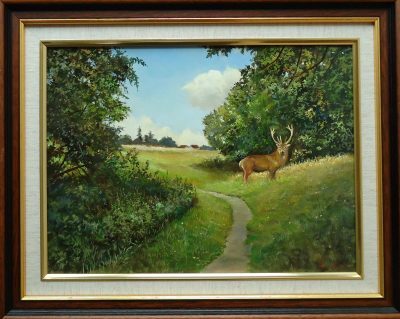 After taking soundings from leaders of his local community he found and donated this painting by Phaedon Constantin, showing a stag at Fiddlers Hamlet near Coopersale Hall, a school Nicholas Hagger founded in 1988. The stag is Nicholas Hagger’s trademark as its branched antlers symbolise the variety of disciplines within which his more-than-40 books have been written. He wrote a short poem to accompany the donation, which is shown underneath in manuscript and text. I bear with me always. 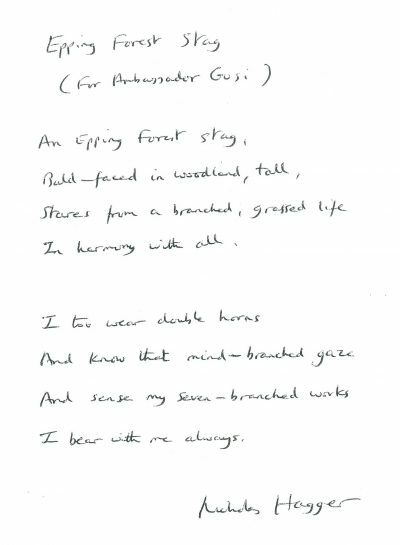 This poem describes an original oil-painting Nicholas Hagger donated to the Gusi Museum, Manila, Philippines, showing a stag with antlers on grass against trees. It is titled ‘At Fiddlers Hamlet, Epping Forest’. Fiddlers Hamlet is near Coopersale Hall School, which Nicholas Hagger founded in 1988. The Bald Faced Stag was a public house in Buckhurst Hill, Essex, UK, and local to Nicholas Hagger’s boyhood countryside. It was established before 1725 and rebuilt after a fire in 1936. Nicholas Hagger’s books are within seven disciplines.